Poke in Montreal - Le Poké Bar - Shut up and eat. 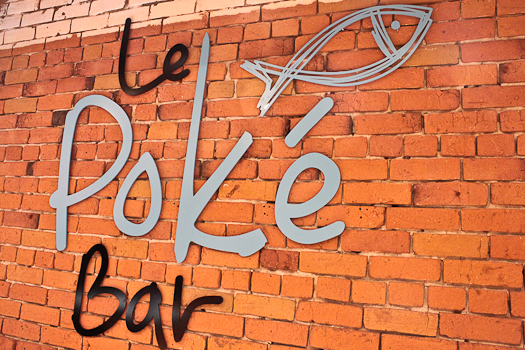 I recently hit up Le Poke Bar on Crescent to try out the hottest food trend in United States that has finally arrived on the shores of Montreal; Poke (pronounced Puh-KAY… or Poké ici à Québec.) Poke is a fantastic dish of lightly marinated fish or seafood that’s native to Hawaii. I can paint you a picture of grabbing a container full of fresh poke from the closest beachside food store, copping a squat on a sandy beach along the turquoise shores of the Big Island, enjoying fresh line-caught big eye tuna while having the sweet dewy mist caress your face from the crashing waves. Unfortunately, our Montreal Poke scene isn’t as romantic. But if you concentrate hard enough and squint just right, the sounds of the street sweeper knocking down orange traffic cones and hold your breath as speeding cars splash puddles of random street juice onto your pants… it’s like you’re almost there. 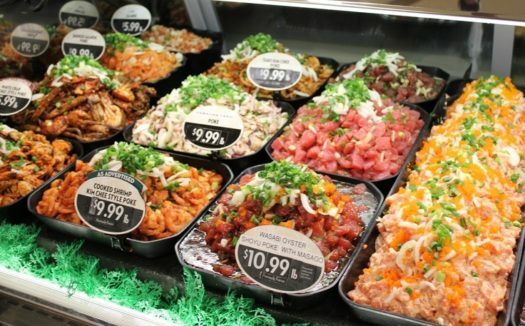 In Hawaii, poke is sold everywhere, from grocery and convenient stores, gas stations and surf shops. Marinaded fish or seafood tossed with a variety of ingredients make up a typical poke. Not to be confused with tartare (where the fish is finely diced), sashimi (thinly sliced fish) or ceviche (addition of acid that denatures or “cooks” the fish) poke is more of tossed “fish salad”. Le Poké Bar serves poke bowls. Their menu is simple; you can either pick from a list of preset bowls or you have the option of building your own. You can pick your base, choice of protein, sauce, and add ons (toppings that include carrot, lettuce, cucumber, edamame, kale, and other good-for-you veggies). 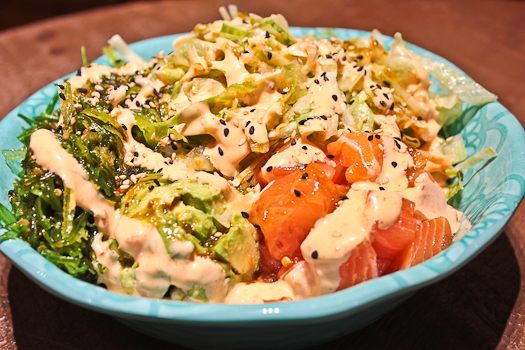 The Maui bowl – salmon, mango, avocado, onions, lettuce and wakame (seaweed salad) on top of rice vermicelli, drizzled with their classic sauce and spicy mayo. The toppings were bright and fresh… until the moment we decided to mix everything together. The noodles were a bit over cooked and the excess water pooled to the bottom of the bowl that resulted in everything being diluted – sauce and flavour of the bowl included. Take a really nice noodle salad packed full of delicious ingredients topped with a savoury dressing, now imagine adding two to three tablespoons of water on top of that and mix it again. That. 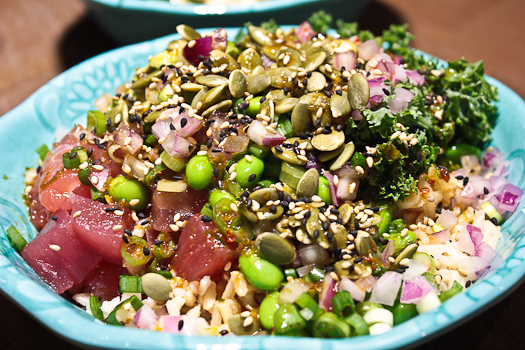 I had the mahalo – tuna, avocado, kale, edamame, red onions, scallions, pumpkin seeds, on top of brown rice topped with the classic sauce. You know that feeling when you go the gym, then get home and have a salad, then walk around the rest of the day feeling healthy, light and pure? This. Large pump cubes of fresh tuna sitting under a pile of health, positive vibes and yoga poses I’ll never master. The fluffy rice soaked everything up like a sponge, amazing. The contrast in textures and flavours in each bite was delightful. 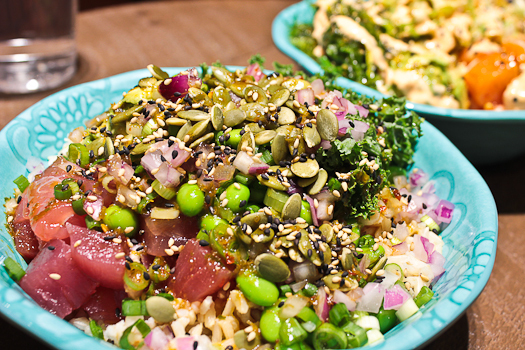 When tossed together, the ingredients from Le Poke Bar form a very nutritious and healthy salad bowl. Concept is great despite the fact that the bowl is packed with filler that it takes away from the actual fish, the poke. Nothing to be said about the quality of their ingredients which were all top notch and fresh. Definitely not chirashi but not quite donburi, whatever you want to call it, these poke bowls are delicious, light, filling and tasted like summer in a bowl.